I'm very sorry to hear of Sue Grafton's passing. Immensely gifted author that always delighted. 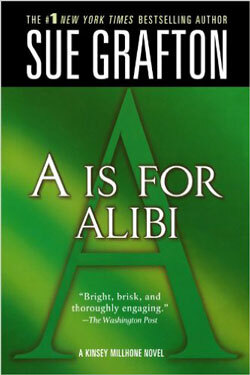 Here's my thoughts on “A” Is for Alibi that originally appeared at Macmillan's Criminal Element. Would you indulge me in some California dreaming? Thanks. So, “A” Is for Alibi, featuring Sue Grafton's private investigator Kinsey Millhone, debuted in 1982—a year before author Ross Macdonald died. Macdonald had created the fictional town of Santa Teresa where his own PI, Lew Archer, routinely patrolled throughout an eighteen book series. The wealthy area (described by Grafton as “a haven for the abject rich”), which—more than a little—resembles the real Santa Barbara, is where a good chunk of the setting of Alibi takes place. I can picture both detectives sitting down at Rosie’s Tavern, Archer laying his fedora on the table, thoroughly entranced by thirty-two-year-old Kinsey Millhone—she a reflection of his younger self—in a symbolic passing of the torch. Nice to envision, right? I had thought her eyes were dark but I could see now that they were a metallic gray. Her look was level, flattened-out, as though some interior light were growing dim. She seemed to be a lady without much hope. I had never believed she was guilty myself but I couldn't remember what had made me so sure. She seemed passionless and I couldn’t imagine her caring enough about anything to kill. Do you hear it? That distinct cadence in the phrasing, an homage to Ross Macdonald without being a rip, building on the work that he molded from Raymond Chandler’s foundation. Kinsey arrived on the scene six years after the last Archer book, The Blue Hammer (1976). And now, twenty-four books later (X was released in 2015), she is the old pro on the scene—and the Alphabet Mysteries is undoubtedly even more popular than Ms. Grafton’s original inspiration. In this first case that we are privy to (she’d been working as a private gumshoe before Alibi), we are allowed to eavesdrop in on Kinsey as she narrates first person (how else, right?) that Nikki had served her time for murdering her wealthy husband Laurence, a successful divorce lawyer that Kinsey had worked with periodically. Official cause of his death: he had ingested oleander that he had thought was his medicine. She now comes to Kinsey to find the real killer. Kinsey starts by contacting Lieutenant Con Dolan, who is described as looking “like he would smell of Thunderbird and hang out under bridges throwing up on his own shoes.” He reminds me a bit of Robert B. Parker'sMartin Quirk in terms of behavior. He has respect for Kinsey (like Quirk does for Spenser), but is still going to make her earn every inch of his veneration. A big clue in the old files is that an accountant named Libby Glass had died ingesting ground oleander four days after Laurence shuffled off the mortal coil. She had worked for a business-management firm representing the interests of Laurence's law firm. So, Kinsey begins pulling the thread, and, in the process, we learn more about her. A lot more. Reading Macdonald, I never felt close to Archer. Respected him, yes; his points of view—certainly. But, he was more of a mentor than a friend. Kinsey, if not an improvement on the old guard, is a rewarding detour from the archaic tight-lipped detective. When Laurence's former law partner, Charlie Scorsoni, stops by to chat her up, she feels the pull of mutual attraction. We shook hands as he left. I didn’t know why—maybe just an excuse to touch. Even a contact that casual made the hairs stand up along my arm. My early-warning system was clanging away like crazy and I wasn't sure how to interpret it. It's the same sensation I have sometimes on the twenty-first floor when I open a window—a terrible attraction to the notion of tumbling out. I go a long time between men and maybe it was time again. Not good, I thought, not good. Newsweek has said, "Grafton has created a woman we feel we know...” True enough. She’s someone you would want to friend on Facebook or share vacation pics with on Instagram. Or, better yet, have her over for tea because that’s where you may learn more about the car accident when she was five-years-old that claimed the lives of her parents and is the continuing pain that’s still lodged deep down. She’d probably tell you how the rebellious streak through school built an autonomy within that has served her well, especially when she became a police officer for the Santa Teresa Police Department, but not kowtowing to authority or management’s treatment of women, prompting her to quit. And, maybe if she really likes you, perhaps you will learn more about those two marriages under her belt. Still, you may have a problem getting close to Kinsey because outside of Rosie, who runs her favorite local bar, and Henry, her landlord, she pretty much sticks to herself—not counting a few relationships sprinkled throughout the series. She did, though, reconnect to family members not long ago. Weird that I’m talking about Kinsey like she’s real? Well, she has that effect on us fans. All the ingredients for the enormously successful alphabet soup are right there in “A” Is for Alibi, with Ms. Grafton stirring it to perfection. We talk a lot about red herrings in mysteries—those pesky little traps that authors set to steer us away from the actual culprits. Sometimes, they are dropped so erratically that it’s effortless to guess what the author is up to or they come in such a rat-a-tat fashion that one loses interest in even trying to guess. In “A”, Ms. Grafton drops them with the organic precision of a Bouguereau stroke. Kinsey is drawn to or away from suspects and we go right along with her right up to the plot twist that gobsmacks her as well as us and has her fighting for her life. “A” Is for Alibi gets an A+ for continuing perfection three decades later. I’m certain Lew Archer is resting easy knowing Santa Teresa remains in good hands. © Tim Wetherell - Australian National University. “Hell is empty and all the devils are here.” Shakespeare’s oft and overused quote has never seemed more applicable than in 2017, a year that has seen a deluge in tidings of geopolitical tensions, racial divisions, mass shootings, natural disasters, and sexual harassment. The weight of the news flowing at an alarming pace has been an assault on the nerves, leaving the senses raw. But beyond the macroscale, it’s also the day-to-day grind of paying bills, finding work, getting (and keeping) healthcare, providing food, shelter, comfort, that serves up a daily megrim of concerns shared, no doubt, by many. For the rest of my article, please click over to LitReactor. When I started on social media more than ten years ago, Bill Crider was the first established writer who left a comment on my blog. I remember that day well, working a security gig in Louisiana, walking out of a large airplane hangar when I checked my latest post. BILL CRIDER left a comment on my site! Honest to hell, I walked on air the rest of the day. From that moment forward, he has continued to be an inspiration, a big supporter of my work, and the greatest of all someone I call friend. Love you, Bill. Here's a post I did a couple years ago on Survivors Will Be Shot Again featuring my favorite character of Bill's, Sheriff Dan Rhodes. Since Too Late to Die (1986), I’ve been routinely traveling to the fictional town of Clearview in Blacklin County, Texas to spend a few reading hours with the amiable Sheriff Dan Rhodes. Though I’m a Yankee, it’s not as far of a metaphysical journey as you would think because I grew up in farm country in a picturesque village in Tompkins County, New York—so I can relate. As a youngster, on any given Saturday, Dad would take me with him to some place in town, say, Mr. Whyte’s garage, when the sheriff pulled in for whatever reason. Still can see that gun riding high on his belt and the so-very-serious look on his face. “He’d arrest his own mother,” Dad warned. A few years later at The Park-It Market, I was buying some Big Red gum, when the same sheriff dropped off some brochures with the year-end crime report for the county. I helped myself to the free copy, since I planned on being a cop when I grew up. I remember reading something to the effect of DWI: 0, Larceny: 1, Aggravated Assault: 0, Homicide: 0, etc. Those zeroes stood out to me, made me wonder “why bother,” but I guess it showed he was tracking such things. Rhodes knelt down. The man on the floor was dressed entirely in camouflage clothing. Even his boots were camo-colored. A hood was over his head, which was turned to the side. Two bloodstained holes were in the front of his jacket. A couple of blowflies buzzed around the holes. A trail of ants crawled under the wall and up onto the man's head. Another trail led back under the wall to the outside. Rhodes didn't want to think about what they might be taking out with them. 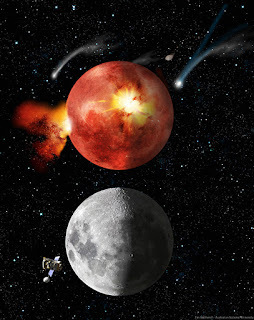 Moving with an alacrity he hadn't experienced since the long-gone Will o' the Wisp days, Rhodes opened the Tahoe door, jumped inside, and slammed the door. He was just in time. The dog that had been two steps ahead of the other, unable to stop his forward momentum, slammed into the door with enough force to shake the vehicle. Or maybe Rhodes was just imagining that. The Tahoe weighed nearly six thousand pounds, after all. 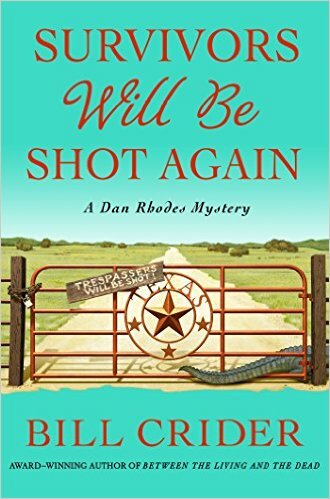 I’ve been amused by Sheriff Dan Rhodes’s exploits since his debut; like an old friend whose anachronistic manner you have come to appreciate even more in the ensuing years. I chuckled while reading Survivors as Rhodes tosses a loaf of bread at a convenience store robber instead of drawing his gun, as well as his droll reference to Keith Richards when he stumbles onto a wannabe thug who, looking to get high, dimwittedly mistakes an urn for a fancy drug container and inhales the contents. Then, there’s the ongoing entertainment of Rhodes’s extreme “patience,” as he somehow tolerates the relentless one-upmanship from coworkers Hack and Lawton, neither of whom aggravatingly ever seem to get around to the point of any given story. And, to exacerbate it all, hanger-on Seepy Benton, a mathematics professor, thinks himself an indispensable Sherlock. Sheriff Dan Rhodes: A Texan Luddite whose keen intuition on human behavior and exalted common sense compensates more than nicely for any police procedures he finds arduous and regularly ignores. In a world of Chicken Littles, he’s a reliable, steady intellect that, though a little worn by time and care, looks at the world at an angle. Specifically, it’s a human comedy that he wants little part of, but as the linchpin of Clearview, he must move forward…just at his own pace. Another humorous thread woven throughout the books is that of a writing team who’ve apparently been inspired by Sheriff Rhodes and have created, to his dismay, a character named Sage Barton (”two-gun hero") in a successful series of adventure-romance novels being optioned for film. Everyone sees the resemblance to the heroic lawman except Rhodes himself. Now, here’s one time I disagree with our humble protagonist, because the good sheriff—not to just the fictional residents of Blacklin County—to me and a number of other readers is larger than life…thanks to Bill Crider. Over the past week, I've reviewed the first three episodes of Longmire's final season that is currently streaming on Netflix. Just click this link and you can follow along with me.